With the Scottish Referendum due to take place imminently I have pulled this example out of my archive. 'To Scotland' is a fine example of the types of themes and concerns that compelled Gilchrist and which could be found throughout his work. 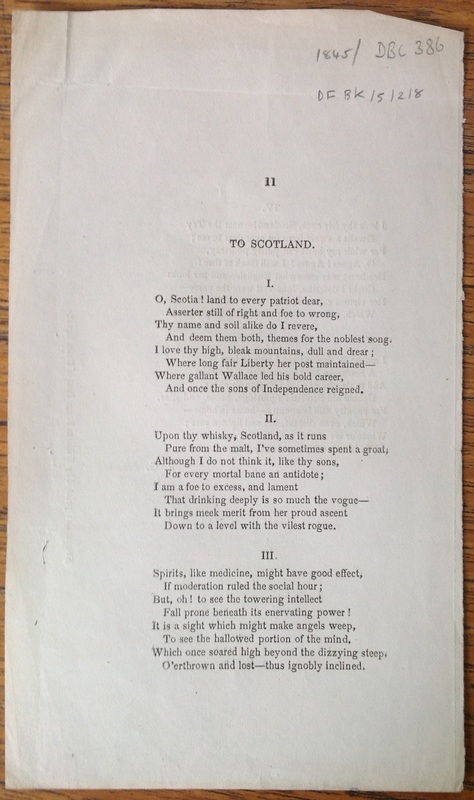 In the poem we see a celebration of patriotism; how the images and landscape of Scotland offer poetic inspiration; a segue into moral reflection (playing to stereotypes of the whisky-sodden Scot) outlining the problems of alcoholic excess over moderation (reflecting Gilchrist's more 'respectable' social position); a nod to the popular airs of fiddler Niel Gow; with the poem ending on a sentimental of home is where the heart is. Gilchrist was familiar with Scotland. He visited the country in 1821, following a wager with the historian Robert White. The journey was conducted entirely on foot. He walked in a circuitous route of 580 miles via Edinburgh and up to Blair Atholl. The route took in places well-known to travellers to the North of England and Scotland, passing through Alnwick, Berwick-upon-Tweed, Dunbar, Edinburgh, Perth, Dunkeld, Blair Atholl, Kenmore, Ardoch, Dumbarton, Loch Lomond, the Falls of Clyde, Gallashiels, Jedburgh, Cornhill-on-Tweed, Rothbury, and Warkworth. 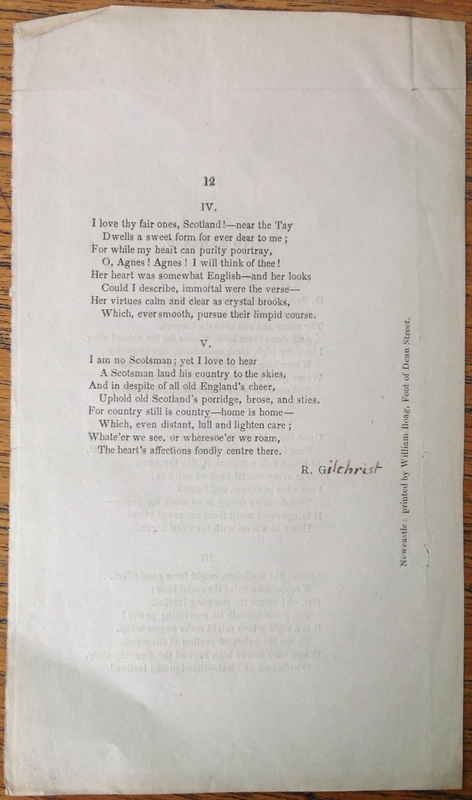 A number of other poems were composed during this trip, including 'On Neil Gow's rural seat'.